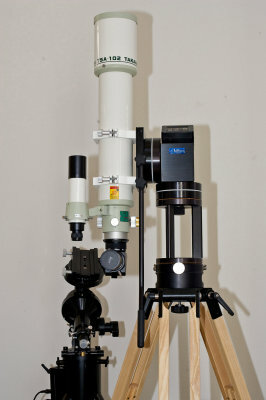 I'm considering a Berlebach tripod for my Takahashi 4" refractor loaded with 6 lbs of Ha filters on the end. 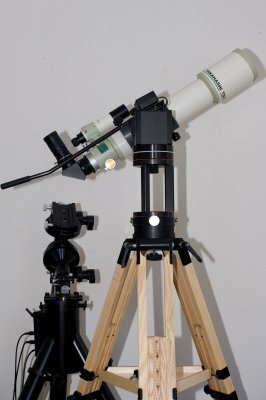 Who owns a Berlebach for a 17 lb+ refractor and what do you recommend? I found that the filters make a huge difference in the requirements for the tripod. So if you used a 4" refractor alone, the same tripod might not work for me. I have experience with only Berlebach Planet. 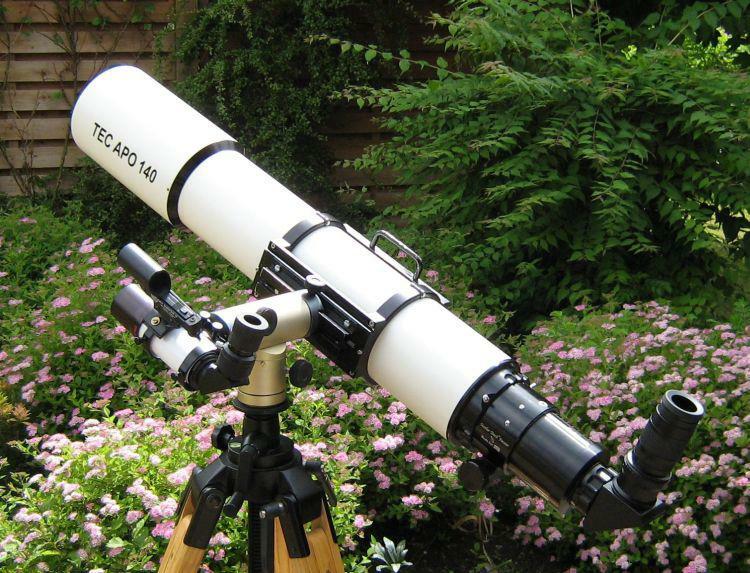 I use it with 4" f/8, 5" f/7, 6" f/8 refractors on DM-6 or G11. I'd recommend the Planet as well. I went with the Uni 24 since it has more height range and I didn't want to deal with an extension and the additional weight. Nice tripod, but for the ED100 it needed the legs extended quite a bit and rigidity was borderline then. It's okay now that I'm using a shorter scope on it with the legs not extended as much. I think the Planet and an extension, if desired, is going to be better for what you are using. I'm really surprised to hear that a UNI-24 is borderline for a 4" refractor even with filters. What were you using for a mount? I had a DM-6 and TOA130 on one for a while (used unextended or mildly extended) and although that combo was pushing it a bit, it performed competently. That said, if I were to purchase another Berlebach I would also go with a Planet. You can never have too much tripod unless portability/travel is paramount - neither the UNI24 or Planet qualify as portable IMHO. Here is a 105 with heavy binoviewers on a HH II and UNI24 (extended) that approaches the kind of weight David mentioned. I never felt I was limited performance wise with this combo and tripod. I use a GM-8 on it (with the very nice Berlebach adapter). That's a pretty substantial thing to control in itself I have found, since the saddle is rather far from the RA axis. And then with the ED100 I had the legs extended to position 45 or 50 to make overhead viewing not require so much bending over. The flexy combination of all of this made steady focusing, even with a 2-speed focuser, quite difficult and not much fun. Not all 4" refractors provide the same rigidity challenge, of course, depends on the focal length and where the balance point is. This was one of the reasons I finally talked myself into getting the TV-85. Brings everything in much closer to the hub and I only need to extend the legs to 25, about 8 inches less. The difference in rigidity felt at the focuser is really significant. I'm experimenting using a UNI14, fitted with double leg clamps and tray for stiffening, with an AP900. On top is either a C8+Tak FS-60C and imaging kit OR a TMB100/800 CNC with the same add ons. I'd prefer a Planet but there is a very big jump in price. Then above that comes the 'Sky' but with another big price hike. I do have an AP portable pier if the Berlebach turns out not to be up to it. I use a GM-8 on it (with the very nice Berlebach adapter). That's a pretty substantial thing to control in itself I have found, since the saddle is rather far from the RA axis. That makes good sense Mike - I believe it. Thanks for clarifying. You are also right to raise that it isn't just about weight. Weight wasn't the problem for me with the TOA 130 and DM-6. A long focal length and off to the side - quite a moment arm and the thing could act like a tuning fork at high mags, aside from the substantial weight alone. But that is one of the advantages of a mount like the Half Hitch that places the OTA over the center of the tripod. I have a Berlebach UNI... (can't remember) with EM200. My imaging setup as shown in the picture. TEC-140+FF + AT66ED guide scope and ring and dovetail. all weight is around 18 kg. It has some vibrate but there is no problem to me. I believe that 20 pound weights has no problem with your setup. I've thought about trying to get those extra leg clamps, since one can watch the upper ends of the sliding legs vibrate when tapping the scope. It helps to kick each leg outward to put some additional lateral tension into the legs, this tends to force the upper ends inward and thereby restrain any vibration. I would expect the Planet to have a big advantage here since the sliding legs are so much wider. I am lucky to have both a UNI and Planet. IMO the Planet is an amazing piece of equipment. It's only about 20 pounds (not counting the tray) and all the parts and wood are much bigger than the UNI. If you don't mind schlepping the extra weight around I'd get the Planet. It will put an end to question and doubts about stability. I found it to be significantly more stable than an AP wood tripod which is the same weight. I like the UNI too, it's very light and quick to set up when portability matters but if I was imaging I'd go with the big one. I think the price is actually very low compared to what you get for the same money in an AP or Tak wood tripod. May I ask where you bought your tripods and which you would suggest (If any) for a TEC 160 F/7 Fl with AP Mach1 mount? Post deleted for product pushing. The Planet sounds about right. Any thoughts on the "Sky" which can hold a Lot more weight, weighs a little less but is a LOT more $? I have yet to order one either for stock or special order. In a nutshell, for those seeking the finest non-metal tripod made today, that's the choice. Jim - I considered the Sky also. I think you'll be OK with the Planet - I purchased mine for almost the exact same gear - AP 160 and Mach1. It works great with just the single clamps. The Planet is already fairly light in weight; I didn't like the idea of even less weight under my scope (w/ the SKy), I was afraid it might make it prone to tipping over. If you're on soft ground be sure to push each spike into the ground by stepping on it at the beginning, this makes it very stable. I use wood blocks under the legs when I'm on paved surfaces. I purchased mine directly from Berlebach in Germany, I think it was before Teton carried them (I had to pay air shipping which was rough! ), they also drilled the top for ADATRI for free. I think you'll love the Planet, the overall quality and refinement is a level above anything else, it's the perfect match for the AP and TEC gear. Scott (and anyone else), can you comment some more on the Planet vs. the AP/Baader, which you described earlier as significantly more stable? My only direct comparison has been between the UNI24 I owned and the AP/Baader. I found the AP to be more stable (not unexpectedly) but the difference narrowed when the UNI24 was not extended (I also had double leg clamps on the UNI24). I'm happy with the AP/Baader with a Mach1 and AP140 (same ballpark as 160 weight/length wise) for visual or non-demanding imaging but I don't extend the legs much. Just curious how you established the "significant" difference. I've regretted selling my UNI24 and I know that a Planet will be in my future as my imaging demands grow (unless I go with a pier) but for now I'm fine tripod-wise. using for about 4 years now a TEC140 on a Berlebach UNI19 (same as UNI18 but with center column, see pic) I don't think a Planet would be neccessary. My scope plus accessories is more than 25lbs (11.5kg). It is highly recommended to using vibration suppression pads also. Damping time is below 1 second. The AP wood tripod is heavier-duty than the UNI tripods. The Planet is in the same weight class also having bigger legs, hub, and clamps than the UNI. What happened to me is that I had an AP 600 mount and wood tripod for many years with an 80's 6-inch f/8 AP refractor. When I upgraded to the new AP 160 the weight of the scope went up a bit, maybe 5 or 8 pounds more, and then around the same time I also replaced the 600 with a Mach1. The AP wood tripod had been fine with the 600/6-inch f/8 combination, but with the 160 and Mach1 on there I immediately noticed more vibrations to the point where it was unacceptable. I tried a Planet with single leg clamps and noticed an upgrade in stability, particularly at high power and on windy nights. I think a good pier would be better than either tripod. It sounds like the AP wood tripod is working OK in your configuration (the 140 is shorter and less moment-arm than the 160). if you want a little more stability you could get a Planet. The other nice things about it are a gigantic tray that snaps into place, instead of 3 screws. Plenty of room on the tray for the keypad and a few eyepieces. The leg clamps are much better than the ones on the AP tripod also, I found it difficult to turn the knobs on the AP clamps without using pliers. honestly I can't say enough about the Planet tripod, it's one of my favorite equipment items ever. I agree. I set up my TEC 160 F/7 with Mach1 on my AP wooden tripod. With the legs extended so the eyepiece height was at a comfortable level for me seated the setup did not seem stable enough to me. Too much vibration at high power and I just did not feel comfortable that the mount was secure. Hard for me to explain but I decided I had to have something else. I considered the AP Eagle but I'd have to add Two of the extensions to get near where I needed the mount height for my visual observations. I found a used Losmandy HD with an extension that works fine. But after getting it together I don't think I can describe it as being portable. So, I am thinking again about something portable. The Planet sounds right and looks beautiful. At 25 pounds it is significantly heavier than the AP wooden tripod (18 pounds). The only thing that competes in terms of weight is the SKY. Yes it is very expensive. It compares more to the AP Eagle with two extensions price-wise. But the weight is under 20 pounds. That is nice. Overall, as long as I feel the PLANET will do the job I am leaning very much toward it with its lower price and beautiful wooden appearance. I'll just have to deal with a little extra weight. Thanks to everyone for this thread. I would not have thought of Berleback without it! Thanks Scott and Jim... I came very close to opting for the Planet instead of the AP after I ordered my Mach 1 but at the time, I wasn't all that confident about getting the holes drilled for the ADATRI, plus I wanted to add some AP accessory trays.. It looks like the dimples (and/or with Mark's help) that is no longer an issue. I am completely sold on Berlebach and have recommended them regularly based on my experience with the UNI24. The Sky looks great and the weight specs are amazing. However, I would really like to hear a field report from somebody before seriously considering that route. I will be looking to add either a pier or a Planet in the next year or two. I'm inclined to go with the Berlebach. - Does the tripod need the additional clamps? 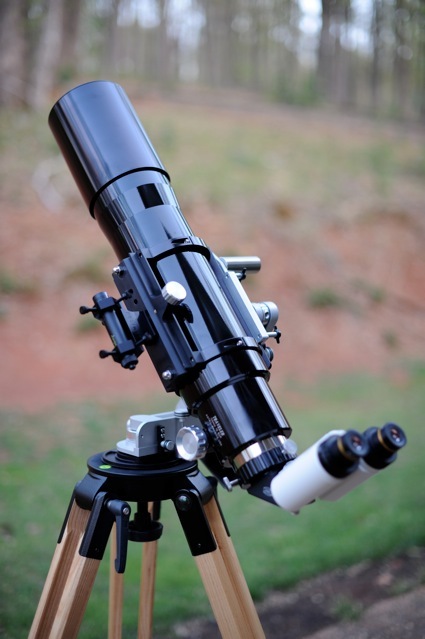 - If you had to buy today would you buy the 24 or the Planet if your 4" refractor was your only scope? - Do you use the pictured setup in a grab and go, fast set up situation? I have a TV 85 that I'll put on the quarter hitch. It is probably about a 10 kg total load, it seems that the 24 would be adequate for that rig. Would you agree? _ if you were going to a TV 101, do you think the Planet would then be necessary? Sorry for all the ?s, just don't want to feel I haven't done all I could to get informed before I write the check. You've can see a few differing opinions here already but I would certainly say that a TV85 with quarter Hitch on a UNI24 will be rock solid - and arguably overkill. The UNI24 is still a substantial tripod and to some, not grab and go. To be honest, for true grab and go I use a very beefy (and ridiculously expensive) carbon fiber tripod even for the 105 plus HH. I guess you might want to be clear in your mind what your viewing style/preferences tend to be. While you can pick-up the UNI24 plus TV85 and walk out the door with it - it is still a big tripod with some weight so I wouldn't call such a move a piece of cake. Just depends on your tolerance level. Seriously though, a super heavy tripod kind of defeats the purpose of a HH, which is a grab and go mount. I use to use a Discmounts DM-6 with an NP101 (and a TOA130 as mentioned earlier) on the UNI24. In that case, i think the UNI24 or Planet makes a lot of sense. 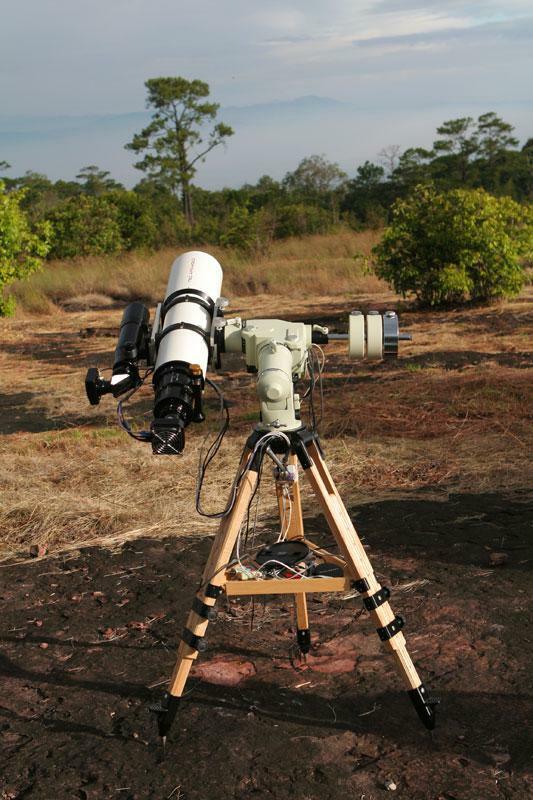 A DM6/Planet combo with a 5" refractor would make for a nice alt/az rig if portability wasn't a primary concern. For my own needs and given my equipment, I have come around to realizing that one tripod just won't do it all. As you grow your own stable of gear you will likely come to the same conclusion. So I have a very lightweight but high performance CF tripod for travel/vacations and around the house grab and go with my HH and 105 or TV76. And I have the AP/Baader for the 5" and GEM. If I take the imaging up a notch I'll need a pier - or alternatively perhaps a Planet. I let the UNI24 go because it was a great medium heavy-duty tripod that I no longer felt I needed after I replaced it with the 2 tripods just described. I regret it though. If you like quality, performance, top design, craftsmanship and wood - I agree with others here who have already said the Berlebach can't be touched. I also think they are reasonable ($) given what else is out there. Another minor consideration with the Berlebach though is the portability of the tripod tray. It may add some stability and it certainly is convenient (and quick to snap in) but it is large and cumbersome to carry around. It becomes an issue if you are traveling but then again, it is a minor issue. The Baader/AP tray is much more compact but anyone who has dropped the #$@& screws in the dark while assembling/disassembling the tripod will tell you it is a real pain. The Lapides spreader looks great but very hard to get. Berlebach use to show some kind of spreader on their site - not sure about how well that might work. Having never tried the UNI24 without dual leg clamps I honestly can't tell you it would make that big of a difference. My gut feeling is that they can't hurt and if you are planning to extend the tripod legs a fair amount that they will in fact help with stability. They aren't that expensive as I recall so - why not? Secretly, I'm looking for a reason to justify another tripod - specifically the Planet. But for now, my pocketbook and financial advisor (let alone my judgment) makes that unlikely. You won't be disappointed with the UNI24. Personally, I would favor stability and performance over portability. But that is the decision you'll have to make. Good luck Jack - and post some pictures. Is there a couple of good carbon fiber tripods you could point me to? I notice that there are a bit pricey, but I can see now that in two or three years There will be another scope. So I should consider something very light for the 85 and something like the planet for the bigger (more light) scope. By that time I might also consider some form of reflector as my second scope, who knows? Berlebach Planet is a very good tripod but it is not as rigid as Losmandy HD/FHD tripod for 6"+ refractor IMHO. It is somewhat weaker in DEC (or Azimuth) moment. It is noticeable when I put 6" f/8 + heavy binoviewer setup (44 lb) on G11/Berlebach Planet, fast swing and stop, not noticeable when it is tracking though. That's why I didn't mention "Rock Solid" with 6" refractor at beginning of this thread. Having said that, I use Berlebach Planet a lot more often than HD/FHD tripod due to portability. Maybe Berlebach Sky is a ticket for you. 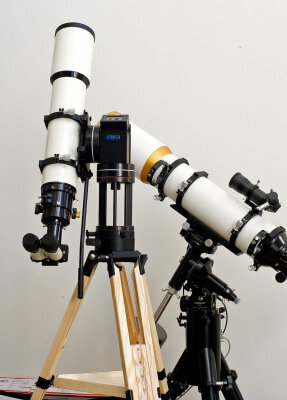 Another recommendation that I can make is Joe's Castoro's tall tripod for 6"+ refractor. I mostly use 6" binoscope on it. I am happy with the tripod (and his Alt/Az mount).